Following in the footsteps of its eSantos brewer line, Bodum has, I suspect, a new instant classic on their hands. 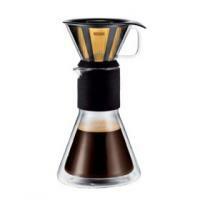 Their new manual drip Bistro model takes a page from the classic Chemex pour-over coffee brewer, and offers a nod to the Eva Cafe Solo. And then Bodum ups the ante by leveraging the twin-walled, heat-resistant borosilicate glass that’s proven extremely successful in their revamped glassware line. There’s two notable improvements over the Chemex here. The first — and long the Achilles’ heel of the Chemex — heat retention. The Bistro’s dual-walled construction solves that issue, and looks spectacular, too. Second, the Bistro forgoes the Chemex’s fussy, folded, paper filters — which were always a challenge to align just right — and uses a gold-plated stainless permanent filter, instead… and in so doing makes this an appropriately green design. Other design bits: a silicone and rubber grab handle at the neck of the brewer, likewise a lid to further retain heat when the glass filter assembly is set aside. I appreciate the fact that the whole kit can be chucked in the dishwasher. And did I mention the, “Hey, my coffee is hovering above the table!” effect? Tres cool. It remains to be seen whether the Bodum gold filter functions as well as, say, those made by SwissGold, but I’m hoping for the best.